As part of its best-selling anthology series, SoulMusic Records is very proud to present “You Ought To Be Havin’ Fun” a solid 2-CD set by the legendary Tower Of Power, considered one of the premier funk ‘n’soul jazz bands of the past four decades. As its title implies, this 35-track collection focuses on two specific periods of the internationally-renowned group’s career: Disc One consists of cuts from “Ain’t Nothin’ Stoppin’ Us Now”, “We Came To Play” and “Back On The Streets”, the three albums released by Columbia Records between 1976-1979; while Disc Two is derived from four albums – “Monster On A Leash”, “T.O.P.”, “Souled Out” and “Rhythm & Business”, released by Epic Records between 1991-1997. Formed initially in 1968 in Oakland, California by horn players Emilio Castillo and Stephen “Doc” Kupka, Tower Of Power’s debut set (“East Bay Grease”) was cut for renowned promoter Bill Graham’s San Francisco Records in 1970; after signing with Warner Brothers in 1971, the horn-dominated band scored a string of hit singles (such as the funk classic, ‘What Is Hip’ and the soul ballads, ‘You’re Still A Young Man’ and ‘So Very Hard To Go’) and best-selling albums for the label (including “Bump City” and “Tower Of Power”, reissued as a 2-CD expanded editions set by SoulMusic Records in 2016 – WSMCR 5146D). 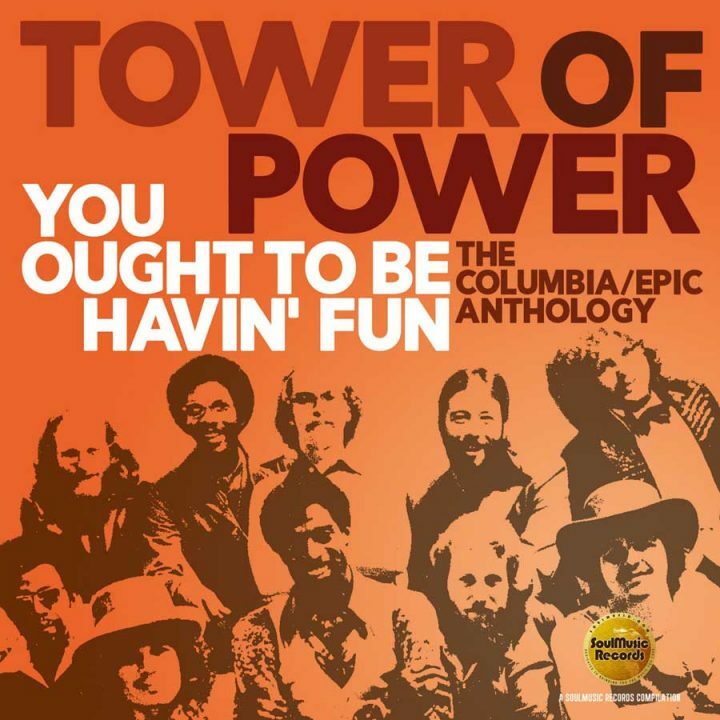 By the mid-’70s, also acclaimed for their exciting live performances, Tower Of Power signed with Columbia Records, self-producing their debut set then working with Stax musical legend Steve Cropper on their second LP and finally with Chicago arranger/producer Richard Evans and Detroit hit-maker McKinley Jackson on their third Columbia album. During the ‘80s, the band toured worldwide extensively before signing a new contract with Epic Records in 1991, resulting in four albums enthusiastically appreciated by TOP’s global audience. Co-produced by David Nathan and distinguished US writer/musicologist Kevin Goins who provided extensive liner notes which include 2018 quotes from Emilio Castillo and others, YOU OUGHT TO BE HAVIN’ FUN features first class remastering by Donald Cleveland and stellar artwork by Roger Williams.